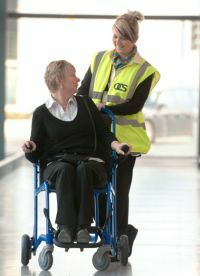 Air Serv, the ground services provider that manages assistance for passengers with reduced mobility (PRM) at Heathrow and other airports worldwide, has come up with an industry first. At Heathrow the company receives around 3,000 messages daily, each containing multiple requests for special assistance for passengers with reduced mobility. Traditionally, these SSRs (special service requests) come from different sources and in different formats requiring considerable processing to identify the action required and dealing with it. By using SITA’s PRM Data Access service, all this has been streamlined. The SSRs are paired with live flight data feeds from another source in Air Serv’s Dispatching System (ADS) allowing Air Serv to provide the highest possible level of consumer service. US citizens travelling to Cuba are very much on the up and are said to top 1,000 per day. US charter companies flying to the Communist-ruled island say business has boomed since President Barack Obama's administration lifted restrictions last year on Cuban-Americans visiting their homeland, and also loosened curbs on academic, religious, cultural and other professional travel. US citizens are forbidden from travelling to Cuba without their government's permission under a wide-ranging US trade embargo on the island imposed nearly five decades ago. 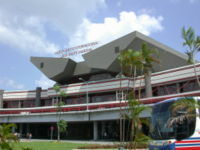 Cuban tourism industry sources said more and more US citizens or Cuba-bound travellers from the United States were also arriving through third countries such as Mexico and the Bahamas to get around the US travel ban, avoid licensing hassles, or simply because it is the less expensive route. Lufthansa is to add to the present fleet of 30 Embraer E-Jets with an order for eight more aircraft deliveries starting in the middle of 2012. Embraer E-Jets are already in service with Lufthansa Regional partner carriers Air Dolomiti, Augsburg Airways and CityLine. Tony Tyler, hitherto CEO of Cathay Pacific Airways, is to take over as Director General and CEO, Giovanni Bisignani, the present incumbent, retires in June of next year. The position is always held by a former airline head. Tyler, 55, has been Chief Executive of Cathay Pacific since 2007. Tyler joined the Swire Group, parent company of Cathay Pacific, in 1977 and has worked with the group in Hong Kong, Australia, the Philippines, Canada, Japan, Italy and the United Kingdom. 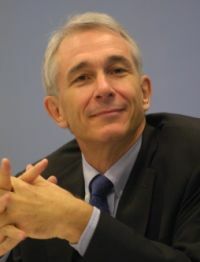 He is also Chairman of Hong Kong Dragon Airlines Ltd and Director of both John Swire & Sons (HK) Ltd and Swire Pacific Ltd. From June 2009 to June 2010, Tyler served as Chairman of the IATA Board of Governors. 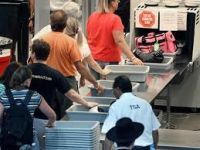 UK Transport Secretary Philip Hammond has confirmed that the ban on liquids being carried in hand luggage onto aircraft is to go. In April 2011 aerosols, gels and liquids in containers larger than 100ml will be allowed to be carried in the cabin. The change in policy is in line with the EU member states also removing the small container rule at the same time. Besides the worry of what one can carry, and cannot, another advantage for the traveller is the likelihood of the so-called ‘duty free’ prices coming down. The airport shops at the present time have the market to themselves. With the removal of the regulations wine in particular can be purchased anywhere and taken through the airport. 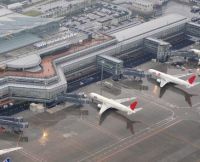 AirAsia X the rapidly expanding Malaysian-based budget airline has made its maiden landing at Tokyo's Haneda International Airport, one of the first new beneficiaries of Japan’s revised airport policy. The airline will initially operate three times weekly from Kuala Lumpur (KL) using one of its fleet of two-class Airbus A330s which also serves other long haul routes. The airline is placing much emphasis on its hub at KL with connections possible to Australia, India and Europe or within the AirAsia short haul network across South East Asia. Sir Rocco Forte, hotelier, was the guest speaker at the Foreign Airlines Association lunch last week at the Dorchester. 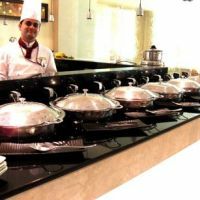 He was in a combative mood and told the story of some guests at a 5-star hotel near an airport who were asked to queue in the terminal with patrons of a nearby budget operation, all of them boarding a courtesy bus and standing for the short journey before being dropped off at the 2-star property and then shown across the way to the luxury accommodation. Of course it never happens. “If you are paying for First Class you expect first class treatment from the minute you arrive at the airport until you finally arrive at the other end,” he said, or words to that effect. The message seemed to get through. Whilst some airlines treat their premium customers extremely well from check-in to “fast track” security, others believe that if they have an award winning cabin that is good enough. Sir Rocco clearly thinks otherwise. Plymouth, and West Country air services have reached a crossroads with the sale of Air Southwest to Eastern Airways (see below). What the future holds both for the city and local airline remains a question mark. Air Southwest is the rump of the former successful Brymon Airways (all the aircraft and even some of the staff) whilst Eastern is a competent and profitable operation based at Humberside Airport, and created in 1997. Plymouth is the working capital of Cornwall and Devon and with a population of close to 400,000, easily the largest city in the region. It is a difficult 200-mile drive from London and has poor railway connections. For centuries it vied with Portsmouth as the home of the Royal Navy and has one of the world’s finest natural harbours. As a tourist area it is sublime. During the Second World War a full scale military airfield was allowed to be built on the beautiful moors surrounding the city but this was returned to nature with the end of hostilities, leaving Plymouth the only major conurbation in the country without a proper airport. At the end of the 1970s, Brymon Airways, under the direction of the late Bill Bryce, developed Roborough, the city’s grass runway aerodrome, as a proper tarmac operation. 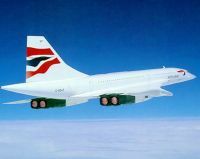 He was followed by the late Charles Stuart, a former high flyer at British Airways, and a visionary who further developed the airfield but made the crucial mistake of not extending the runway sufficiently for the new generation of 100-seat jet aircraft. To this day the BAE Avro and Embraer E series’ aircraft cannot operate into Plymouth City Airport (except with a reduced load – although there is an argument that with residual values now for the older jets the working parameters have changed). Bryce introduced services between Plymouth and Heathrow and both the airline and city prospered - Brymon becoming the lead carrier for the London City Airport project and Plymouth gaining major international companies, including BAE and Panasonic. With new management lacking long term vision Brymon pulled out of London City, and Air France took over its obligations. British Airways purchased the airline, dropping the highly successful Heathrow route. The slots could be used by larger and commercially more attractive aircraft. Gatwick, as an alternative to the world’s most important international centre, does not really work. The connections were lost. Major companies left Plymouth and finding replacements became more difficult. Bryce had purchased a long lease on Roborough in order to substantiate the airline. In 2003 British Airways sold the airline/airport package to Sutton Harbour Plc, a local property developer who re-invented Brymon as Air Southwest. What their real motives were has to be debated but a runway development never went ahead and last year they were given permission to build up one of the two runways as a housing development (with the new neighbours certain to complain about the noise – a not dissimilar situation to Heathrow but on a smaller scale). Air Southwest, whilst well known locally, did not get the same national exposure as Brymon which may have been a contributory factor to unsustainable losses. In any event earlier this year Air Southwest was put up for sale by the Plc, Eastern emerging as the new owner. Sutton Harbour still retains the lease, the ultimate owner Plymouth City Council. There is a very strong argument that lifeline routes into Heathrow should be ring fenced, which would give Plymouth salvation with connections to the wider world. The loss of Heathrow, predictably, hurt the city. Newcastle and Belfast need this protection too, and likewise Leeds, Inverness and Newquay, cities whose air links are via Gatwick. Where does Eastern/Air Southwest go from here? Using Newquay Airport, an hour’s drive across the border into Cornwall, is not a serious consideration for the business traveller. At 45 minutes (on a good day), Exeter is nearer but offers no London link and is essentially dedicated to leisure traffic. Devon County Council and Plymouth City Council need to do some serious thinking about where Plymouth is positioned in the 21st century. The massive harbour has missed out completely on the cruising boom. Just 13 ships would have visited this year. Guernsey, which does not have a harbour (ships moor in "The Roads" with a tender transfer to St Peter Port)) will have hosted 60. And as lovely as the Channel Islands are, Plymouth and its hinterland has a lot more to offer. Southampton Airport has boomed with the cruise ship business. So could Plymouth. Plymouth City Council should make it clear to Sutton Harbour Plc that what remains of the airport cannot be turned into a housing estate or industrial complex and needs new management with imagination and vision. If the worst came to the worst it should become the Air Southwest/Brymon Memorial Park. Let is hope it does not come to that. We wish Eastern Airways well in its latest endeavour. London City Airport’s BA Cityflyer operation is to gain more aircraft, more routes and more frequencies in 2011. Chambery, Faro, Malaga and Stockholm will be added, plus extra daily flights to Amsterdam, Edinburgh and Glasgow. Summer services to Palma and Ibiza will also recommence at the end of March. Two more Embraer E series aircraft will join the fleet bringing the total to 13. Continental Airlines, whose name is about to disappear following its merger with United Airlines, has branded as "absurd" the guilty verdict by a French court against the airline and one of its mechanics over the 2000 Concorde crash and has pledged to appeal. Welder John Taylor was given a 15-month suspended prison sentence and the airline was fined €200,000 by a French court on Monday over the crash which killed 113 people. "We strongly disagree with the court's verdict regarding Continental Airlines and John Taylor and will of course appeal this absurd finding," UK-based Continental spokesman Nick Britton said in a statement. Sutton Harbour Plc has completed the sale of Air Southwest to Eastern Airlines. 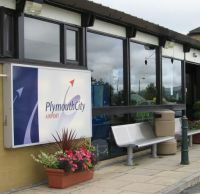 It retains the leasehold ownership of Plymouth City Airport where it last year closed one of the two runways, which has now become a housing estate. The sale is expected to result in a net cash outflow from Sutton Harbour of approximately £1.3m to Eastern. 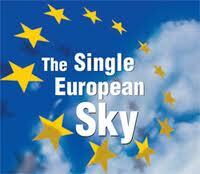 The Council of EU Transport Ministers, and the members of the EU Single Sky Committee took far-reaching decisions on 2 and 3 December which will impact progress towards a true Single Sky over Europe. Such measures should eradicate any future strikes by controllers in individual countries although Spain is not a signatory at the present time. Six EU member states agreed on a legally binding treaty to deal with air traffic management over the air spaces of Belgium, France, Germany, Holland Luxembourg and Switzerland. Dublin is to reduce its air passenger tax from €10 to €3 in a bid to support tourism, as part of the debt hit country's recent budget review. Ryanair boss Michael O’Leary, who campaigned vigorously against the tax, is still not happy. “Today’s budget proves yet again that this Government has no tourism policy. The reduction in the €10 tourist tax to €3 was forced on them by the EU Commission’s infringement proceedings,” he said. The move is interesting with some countries, the UK and Germany being typical, either increasing or introducing taxes, whilst others, led by Holland, are abandoning such schemes. New York is the new headquarters of the oneworld airline alliance replacing Vancouver. The move comes with the appointment of Bruce Ashby in a new position as Chief Executive. Leaving oneworld is John McCulloch after ten years with the central alliance team – the last seven as Managing Partner. Bruce Ashby can be described as an airline industry veteran. After 16 years working for US carriers, latterly as Senior Vice President Alliances and then Executive Vice-President Marketing for US Airways, Ashby then spent the past five years leading carriers in India and the Middle East, as Chief Executive of IndiGo and then of SAMA Airlines. Oneworld points out that the move to New York is simple logic. It is served by more oneworld member airlines than any other city worldwide, with ten of the 14 existing and designate members flying to at least one of its airports. The city's three main gateways of JFK, LaGuardia and Newark are served, and four other airports in New York State. Last week AERBT reported on Ecuador and that remarkable country’s leap in the 21st century. 500 miles off the coast are the Galapagos Islands discovered by the Spanish in 1535 but not really put on the map until an unplanned visit by a young British naturalist called Charles Darwin in 1835. Metropolitan Touring had excellently hosted your Editor, finally delivering him to Quito International Airport for the 60-minute flight in a brand new two-class Aerogal Airbus A320 to the port city of Guayaquil, Ecuador’s largest conurbation. After 24 hours it was on by the same aircraft to the tiny airport on San Chistobal, capital of the Galapagos province. At that point Ecoventura, a specialist operator, took over. 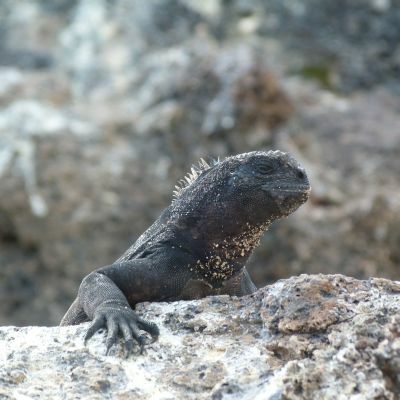 Visiting the Galapagos is an experience and very strictly controlled. Only 85 ships are licensed to use the waters with the largest offering just 50 cabins. All the vessels must carry official guides who are limited to 20 visitors each. Visitors start their tour with a flight to one of the two large islands of San Chistobal and Santa Fe, each with a small town. An alternative is to stay at an eco hotel and take day trips to the various islands. That does not mean escaping seas that from time to time can be less than smooth. It all depends on where the wind is coming from. The Galapagos islands and its surrounding waters form an Ecuadorian province, a national park, and a biological marine reserve. 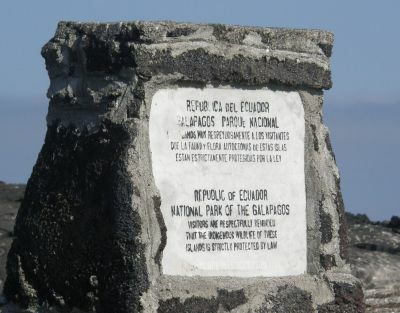 The principal language on the islands is Spanish. The islands have a population of around 23,000. Our home for seven nights was Motor Vessel Eric, one of three ships operated by Ecoventura and flat out at eight knots. Accommodation was on three levels. The cabins are adequate but do not expect the luxury of an average cruise liner. There was plenty of storage space for clothes but only casual clothes and hiking boots are required. Perhaps also flip flops for ‘wet’ landings. Just 20 passengers maximum and a briefing every evening by two top class naturalist guides who were also experts in scuba diving and snorkelling. The ship offered a fine sun deck and also a comprehensive water sports’ kit. Wet suits are provided as the sea can be cold when experiencing underwater sea-life. What was very apparent was the splendid spirit of camaraderie apparent within the group. Keen naturalists and a senior university lecturer mixed well with a Hollywood producer towed along by his writer wife. Plus several whose interest in nature would be best described as casual. Most days were split into half, alternating a land exploration with ocean activities. The islands straddle the Equator (necessitating a visit by Neptune and his friends). The Galapagos are unique. Where else on earth can you see, seemingly happily living together iguanas by the thousand, likewise pelicans, sea lions basking in their hundreds, giant tortoises, blue footed boobies, albatrosses, cormorants and frigate birds. 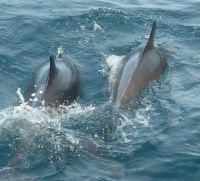 In the clear waters there are whales, dolphins and (tame) sharks. Charles Darwin's voyage on the Beagle lasted five years. He only spent five weeks on the Galapagos and it took him another 20 years to develop his thesis and commit it to print. He never left England again. Such was his eminence as the premier naturalist of the age he was given a State Funeral when he died in 1883 age 73. He is buried in Westminster Abbey among the great of the 19th century. Arrival and departure to Eric is by tender. Whilst most landings are very easy sometimes one actually has to wade into the sea by the shoreline. Ankle deep only. Once on land the majority of the islands do have well used rocky paths but sometimes they are very uneven. On the island of Isabela the climb is 400 steps. It’s worth the effort mind you. Most of the walks are limited to about one hour and the guides are conscious that for some the terrain in not easy. Undulating would be the right description. Nothing too difficult but you need to keep your wits about you. A must for visitors is the Charles Darwin Foundation headquarters, a short stroll from the centre of Puerto Ayora on Santa Cruz Island. 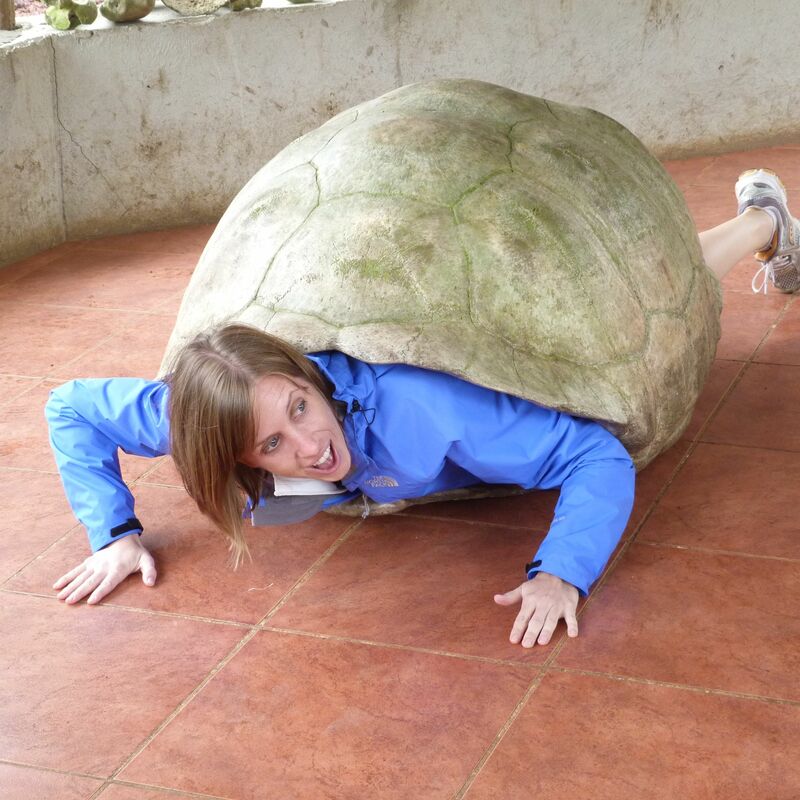 Allow a couple of hours for the visit which includes a breeding centre for giant tortoises and an exhibition describing the various varieties of these remarkable creatures. Here there was a unique photo opportunity with a pair of empty large tortoise shells. Two of our party were volunteered to get into them to experience what it must be like living in a shell. Over a seven-day period we covered a little under 500 miles. 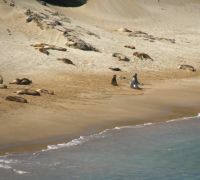 How far we walked one does not know, nor the number of sea lions spotted. 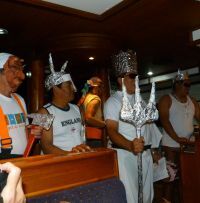 Other operators offer larger ships with up to 100 passengers but with just 16 in the party and two very good guides one could not ask for more. No queuing to start with, two Zodiacs capable of accommodating everyone. 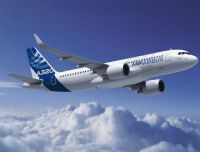 Named the A320neo, Airbus has copied a Boeing move from the mid-1990s with the announcement of a revised A320 series aircraft with two new engine offerings. The difference between the then Boeing NG (New Generation) offering is that Airbus says it will continue with the existing engine/aircraft arrangement subject to orders. Airlines have the choice between CFM International’s LEAP-X engine and Pratt & Whitney’s PurePower PW1100G engine. The new engine option also incorporates fuel-saving large wing tip devices called Sharklets. Airbus will start deliveries of the A320neo family in spring 2016. 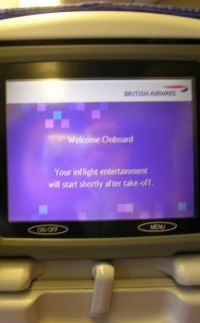 British Airways passengers (on suitably equipped long haul aircraft) can now avail themselves of four TV brands on the inbuilt flight entertainment systems (IFE). Called High Life, the brands are BBC Entertainment, BBC Lifestyle, BBC Knowledge, and pre-school channel CBeebies. On BBC Entertainment, the slick team of expert con-artists in Hustle (starring Adrian Lester, Robert Glenister and Matt Di Angelo) execute their elaborate ploys to part greedy fat cats from their cash, while Idris Elba stars as the eponymous antihero of Luther, an enigmatic detective battling his own demons. On BBC Knowledge, factual entertainment enthusiasts can join the inimitable trio of Clarkson, May and Hammond on Top Gear, while Charley Boorman uses some extreme – and extraordinary – means of local transport to travel from Sydney to Tokyo..
Food aficionados should look no further than BBC Lifestyle, following the drama of 20 celebrities who stir, sauté and season their hearts out in the hope of winning TV's toughest cookery competition. 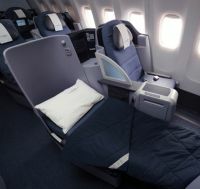 The Boeing 777 long haul fleet of Continental Airlines (CO) is now all flat-bed seats in its BusinessFirst cabin. The airline currently operates the 777-200 on international routes between its New York hub at Newark and Beijing, Delhi, Frankfurt, Hong Kong, London, Mumbai, Shanghai, Tel Aviv and Tokyo, and also Houston to Heathrow and Tokyo. The BusinessFirst flat-bed seat reclines 180 degrees and provides 6’ 6” of sleeping space in the fully extended position on the Boeing 777. Continental says it is one of the widest Business Class seats in the air, measuring up to 27” wide. Laptop power, headset and USB plugs are conveniently tucked above the customer’s shoulder. The screen monitor is 15.4” and iPod connectivity is provided allowing customers to view their personal videos and enjoy their music while their unit is charging. Air New Zealand says its much anticipated Skycouch Economy and Spaceseat Premium Economy seats should make their initial public showing towards the end of this month with the anticipated introduction of the first of five Boeing 777-300ER aircraft. The first 11 window rows in Economy Class will feature the Skycouch, which folds out to provide a space for kids to play or two adults to sleep but there are no privacy curtains. Passenger traffic at Heathrow grew 4.3% during November against the same month last year, leading to a fifth consecutive highest ever month. At the same time airports owner BAA, made available figures showing transit time for security in the first nine months of 2010 to be less than five minutes 97.9% of the time. In October, baggage arrived on carousels on average 34 minutes after the aircraft touched down. The operator has a target of 35 minutes. In 2009 the figure was 37 minutes. Bombardier Aerospace chose the Middle East Business Aviation show in Dubai last week to announce it has received firm orders for five midsize Learjet 85 and two large cabin Challenger 605 jets, from multiple companies of the same group, for principal operation in Germany by Munich-based Jet Air Flug. The total value of the order is approximately US$155m. Heathrow Terminal 4 is the new home for Qatar Airways at the world’s busiest international airport. It was previously in T3. The Doha-based carrier’s switch follows the completion of a multi-million pound upgrade that sees T4 now offering passengers improved amenities, enhanced baggage facilities as well as a wider selection of restaurants and retail stores. 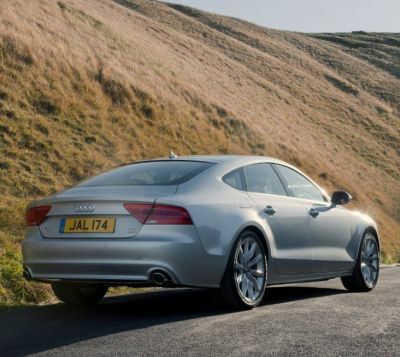 New Audi A7 Sportback is Ace! Audi’s pace-setting new car programme is a demonstration of how to generate product desire regardless of the world’s economic situation, this resourceful car manufacturer pitching right across the premium car market in so many sectors that it has become challenging for me to choose a personal favourite example. That’s until Audi produced this latest ace out of the pack – the Audi A7 Sportback – a car that I suggest will knock many affluent buyers off their feet! Here, is a car that does not stand still, even when parked, it is swish, sleek, the flowing lines I would say almost feline, the classic lines captivating admiration during my driving session. There are some tremendously good looking Audis but I think this is the best yet! The concept is that of a supremely spacious, four-seat executive class comfort ability, more than acceptable load carrier with a performance CV that indicates fine art rather than macho but in reality has the design, build and mechanical power to deliver great satisfaction . At launch the new Audi A7 Sportback will be available to order with two V6 petrol 2.7/3.0 engines and two 3.0 V6 turbo diesel engines in two power outputs and with lower priced variants using front wheel drive as well as the notable all wheel drive quattro transmission driving (according to variant) through either a CVT automatic transmission or a seven-speed S tronic twin-clutch transmission on the all wheel drive versions. There are two specification levels SE and S line with prices starting at £43,755 but that is before one starts to create, at the order stage, a bespoke car (there are no off-the peg models in this programme). It is easy to add about another £10,000 of extras that can range from an amazing ‘Audi first’ Google see round the corner view satellite navigation system at nearly £1,200, via oad facility with removable ski/snowboards bag at £210, to a BOSE surround system and plenty more. Create your own car and wait, at the time of writing, until sometime in 2011 for delivery as Audi’s production capacity is fully stretched clearly proving the success of the product range. With the A7 Sportback Audi has continued development of its weight/strength body building programme by utilising aluminium in variable densities/mouldings according to the loads placed on a particular component. At launch I have driven versions powered by the V6 turbo diesel engine and, to a greater degree, this 2.7 T FSI quattro SE S Tronic petrol version that checked out at nearly £58,000 following the addition of some of the afore mentioned extras plus sports suspension. Think it, they can probably include it! For driving performance I found it the velvet glove of motoring, the V6 179 bhp engine so refined, so flexible (the diesel too) that it purred along but when required could unleash a mass of driver enjoyment under the right circumstances as the transmission sparked into action when commanded by my right foot or tempered things in extreme safety under the highly efficient braking system. Relax a little, use the speed control and selectable driving mode or just keep an eye on the face up (not fitted on this car but available) information projected on the windscreen. Take for granted the (cost extra) support of the powered with memory adjustable seating, hardly notice the way the well honed suspension dealt with varying road surfaces for both the ultimate grip provided by the all wheel drive transmission that is easily smoothed out the imperfections in the road surface. Be confident that your passengers will be relaxed in the excellent accommodation provided and that they have not had to be subjected to ‘just hand luggage’ in the commodious 535 litre luggage space, the hatch of which is touch operated, the rear shelf hinged in unison with the large tailgate and even the support struts smartly sheathed rather than the bare metal piston devices usually on show in other hatch back cars. Believe me driving or travelling in this ace from Audi is a journey of discovery, perhaps a new beginning for a driver jaded by the repetitious ordinary character offered by some costly cars that have perhaps rested on their laurels for a bit too long. Having observed at first hand the progress of the Audi marque from an originally hard to notice product to a major player in virtually every form of motor car I can be accused of taking for granted the fine build quality, the smart but tasteful trim, the excellent build quality and the sensible planning that is clearly in evidence that I can only suggest that those who are yet to be enlightened and have the resources are short changing themselves if they don’t find out pretty quick. 30 mpg potential for what is a heck of a lot of car. Wallow perhaps that the folding rear spoiler, developed from the iconic Audi TT, reveals itself in James Bond manner at speeds over 70 mph. Keep and eye on your back by the rear view camera that also keeps operating to show a rear view as you move off forwards… as if an Audi driver would forget to check the rear view mirror! With 12 more new models forecast for 2011 it is evident that Audi has not only arrived on the big scene but ownership is a major ‘must have’ accoutrement for those enjoying success in life. Rivals include: Mercedes-Benz CLS, BMW 5 Series GT, Jaguar XF. Price From: £47,000 - as tested: £57,950. LAND ROVER: A special edition 500 run of a Land Rover Freeleander 2 has been launched at Bologna Motor Show. Powered by a 1.8 litre 189 bhp diesel engine with 6-speed automatic, it is offered in exclusive colours priced from £33,945. VOLKSWAGEN has overtaken Ford as the UK’s largest supplier of motor vehicles. However it is the Volkswagen Group that holds the title rather than VW itself. Bentley today is part of VW Group as is Audi, Seat and Skoda. Ford can claim all the glory still leading as a stand alone marque, the Fiesta and Focus models Britain’s biggest sellers.